Match is 13th July @National Stadium, Dar-es-Salaam. Your point about having the team that played the final play Everton makes sense entirely. This was their baby and they should ba allowed to nurse it to maturity. @ Jathur go ji I totally agree with you on the point save that all should be tested…. Let us get down to the immediate business. We have a crucial league match against a rejuvenated Sofapaka in Meru and that is what we should all train our sights on. Enough of clobbering Efusi. Efusi accepted and moved on and we too should do likewise. Talk of being ready for Everton’s game which is still one month away is rather premature to me. I see it differently, let’s not encourage camps in GMFC. That’s a recipe for disaster. Remember we still have the league and shield competition. Players who missed the Super Cup were forced to be away because of national team obligations. Let K’Ogalo always field,for each & every match, players based on merit.That’s the only way to increase competition and improve the club’s standards/performance.Even the coaches should be assessed based on targets/merit. We need to build a team that can reach the group stages in CAF tournaments and let’s not forget SP Super Cup was not even a real CECAFA test. I have been saying and urging our officials to at least recognise our legends who made us proud. have been advocating for medical cover for our former great. and free passage for all our former players in our matches. Now Legend Peter Dawo is illing what is the club doing to assist him? Nice one but it seems i. Gor things move only when fans make enough noise…is there a noise leader? However such names don’t hold water coz they come from Kingdom partakers of the loot. As for Dawo, those whose hearts have been touched by angel Gabriel will contribute via the paybill no. The Gor officials led by Mugabe have no interest in such weighty matters. I only heard of Peter Dawo, Peter dawo na mpira onradio when I was growing up as a young boy, but I will definitely contribute towards his treatment. I really hate it when a nondescript club like Yanga talk of recruiting our players like we dont even exist , but I guess that is the price we have to pay for being development dwarfs in terms of common sense organisation and structures. Graham Stuart believes Everton will have a “test on their hands” when Ronald Koeman takes his squad to Dar es Salaam in July to play Gor Mahia. The Club Ambassador was able to compile a mini scouting report on the Toffees’ opponents in Tanzania after being a special guest at the SportPesa Super Cup final on Sunday, which was won by the Kenyan champions. 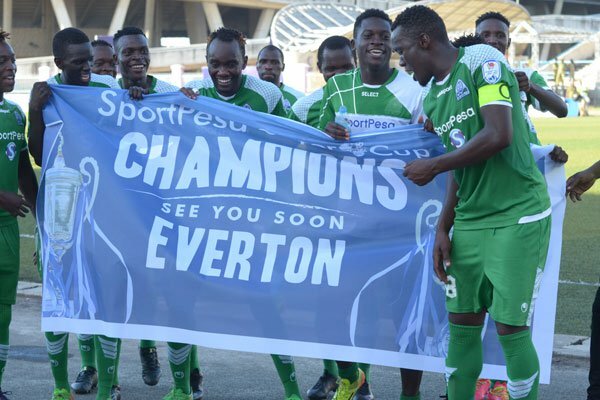 Gor Mahia convincingly beat rivals AFC Leopards 3-0 at the Uhuru Stadium to earn the opportunity to play Everton in what will be a groundbreaking fixture in the East African nation on 13 July. As part of the new partnership with SportPesa, Everton will be the first Premier League club to play a game in Tanzania. “Gor Mahia played very well on Sunday,” said Stuart. “They edged the first half without scoring but once they got their first goal, they relaxed and played some wonderful football. “As you get with African sides, they are fit, strong and have an appetite for the game. Their attitude was excellent. “They are up to speed in terms of their season and with it being one of our first games of the summer, it could be a bit of a leveller. And there are the conditions as well – it’s very hot and sticky. The manner of Gor Mahia’s victory was even more impressive considering seven of their first-team regulars were missing having been called up international duty with Kenya. “In some respects, you could say that was their second-string side that went out and beat the Leopards 3-0,” added Stuart. “They are going to be a really strong side. Mr. Chairman and the entire EC please don’t allow the coach or any player to leave at this time…. ADIOS AMIGOS TIKI TAKA COACH……. Gor Mahia coach Jose Marcelo Ferreira “Ze Maria” is on his way out of the 15-times Kenyan Premier League champions due to “frustrations”, according to sources. The Brazilian, who succeeded Scotsman Frank Nuttall in March 2016, is said to be “upset” and “frustrated” that the club chairman Mr. Ambrose Rachier has been dodging him over his salary arrears and other monies the club owes him. “He has been trying to reach Rachier in vein. They were supposed to meet after returning from Tanzania but the chairman has been unreachable,” a close source told Soka25east.com. Ze Maria returned from leave to guide Gor in the Sunday final of the inaugural Sportpesa Super Cup, where they beat arch rivals AFC Leopards 3-0 to lift the cup in Dar es Salaam, Tanzania. His deputy Zedekiah Otieno “Zico” had been in charge from the start of the tournament at the quarterfinal level. Unfavorable welfare of players is another area where the 1996 Olympic bronze medalist is unhappy about. According to one source, Ze Maria has already bought air ticket back home and could leave the country Thursday. Efforts by his physical trainer Sandro Fantoni to persuade him otherwise are said to have fallen on deaf ears. Despite failing to defend the KPL title last year and going the whole season without lifting any title, Ze Maria has had a better start to the current season. He has already bagged two trophies and the team is currently top of the table standings. Ze Maria’s cellphone is off and efforts to reach club officials for comments have been futile. Truth is Zico won the cup. Now what is this again really?Can’t we be happy even for a eek after triumphing in Tz before sad news follow in earnest about sponsorship money doing everything else in someone’s private company instead of paying the coach and players their Dues?Why do we even have Sportpesa sponsorship really if we cant pay the coach and take care of players welfare? That is how he operates and those are his designs that he has over trhe years polished with ego and qualified with his gigh education to the chagrin of Kogallo fans. It took one Lens Julians years to remodel a winning outfit. Thanks to legends like Zack Mbori. With him year in year out he ships in one coach and acrimoniously ejects them back with shame. I fault the coaches on one hand, they don’t study the kind of man they are dealing with to make adequate contractual agreements, he outwits them with ease of legendary Kogallo midfielders iof the golden era.-ZAngi, Zamalek, Fundi, Engine, – He has refined his movements as best as he can to be called ‘wuon pap’. Who will stop him? If not FKF, then CAF or FIFA. How is this club being run? If these rumors are real, then there is a very big problem with the Excom.